No fuss, no frills, wholesome, easy-to-prepare food for beginners, busy people or anyone who wants to prepare good meals quickly. Forget Jamie, Nigella and Heston and those glossy pictures of edible sculptures that have been whipped, separated, diced, minced, sauteed and simmered for six hours while you patiently stirred every two minutes. The 'I Can't Cook Book' has no fuss, no frills, just good wholesome, easy to prepare food that is a blessing to the kitchen klutz. This is a 'must have' book for those new to the kitchen: just moved out of home, newly married, newly divorced, whatever the circumstances the 'I Can't Cook Book' will painlessly turn you into an 'I Can Cook' with its easy to follow but delicious-to-eat recipes. 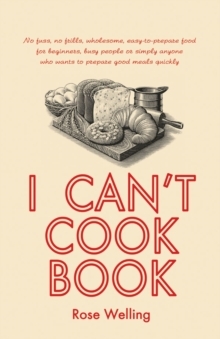 The 'I Can't Cook Book' will save you money, be good for your health, tantalise your tastebuds and best of all you will learn that you can cook.